We are very pleased to announce that the joint Captains of Newton Green Golf Club have chosen Kernos to be their local Charity of the Year for 2016/17 . This partnership, which launched on Monday 7th March 2016, will see the Golf Club sponsor various fund-raising initiatives on behalf of Kernos during the Captains’ 12-month period of office. Reciprocal arrangements agreed so far include Kernos running a Mindfulness session for NGGC in April, entering a team in the Club’s next Society Open Day and making a presentation about the Centre to Club members in June. Founded in 1907, Newton Green Golf Club, originally a 9-hole course designed by 5-times Open Champion James Braid, was extended to 18 holes in 1994. 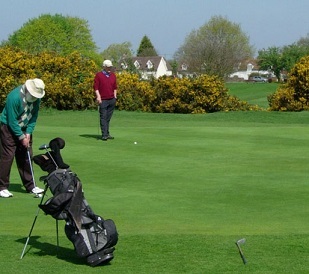 Located on the A134 just outside Sudbury, the Club currently has some 480 members who enjoy playing the challenging 5,961 yard par 69 course, widely acknowledged to be one of East Anglia’s finest. Kernos was founded in Sudbury in March 2003, with a mandate to provide professional counselling and support for local people suffering emotional and psychological difficulties. We are funded and supported entirely by grants and charitable donations, ensuring that those most in need receive appropriate, effective and on-going help, regardless of their personal resources or circumstances. We are very much looking forward to working with NGGC during the coming year and trust that the partnership will prove to be a mutually beneficial one.